We now offer two convenient ways to load up on MR MIKES great taste. 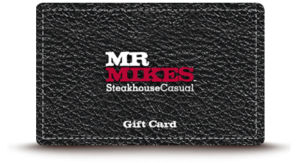 Pick up a gift card at any MR MIKES location and load it up with any dollar amount. Send an instant electronic gift card through the button below. It’s easy, personal and tastes better than an over-priced card from a department store.